You must make reservations at least 5 minutes in advance of the time at SS106 Aperitivo Bar. 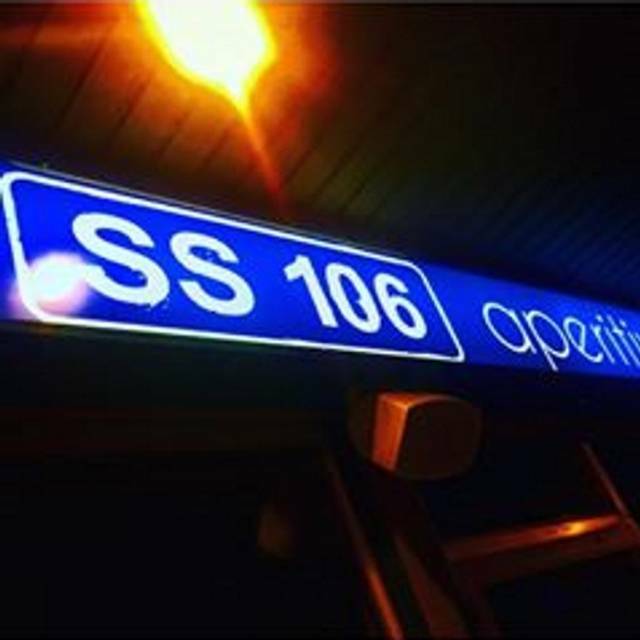 SS106 Aperitivo Bar is named after a highway which stretches 491 km from Reggio Calabria to Taranto , along the coast Ionian of Calabria , Basilicata and part of Puglia in Italy. 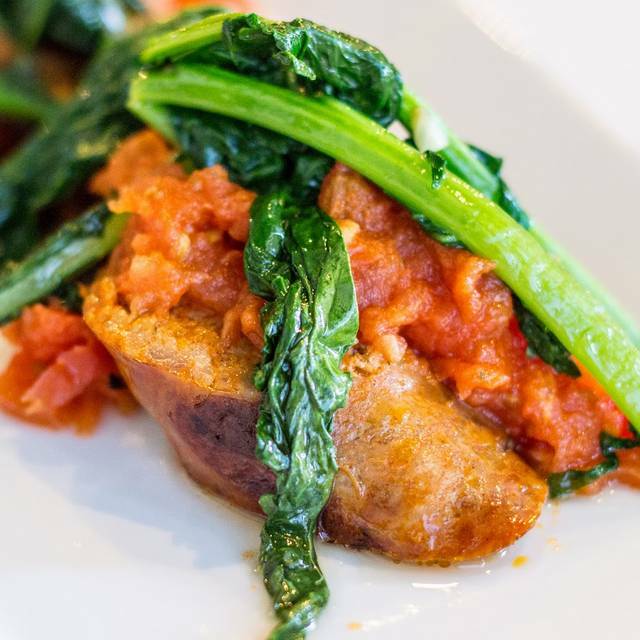 We pride ourselves in bringing Italian dishes with a bigger influence of Southern Italian Cuisine. 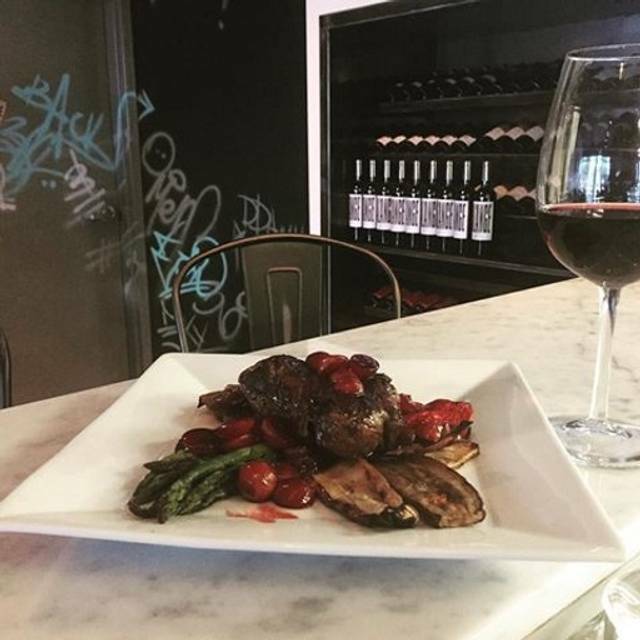 Our motivation of opening this restaurant/bar is to bring the Italian lifestyle and social aspect of Italian Culture to Calgary. Start with cappuccino in the morning to a full meal any time during the day or evening. All our cocktails our made with fresh squeezed juices. Our wine list is extensive. 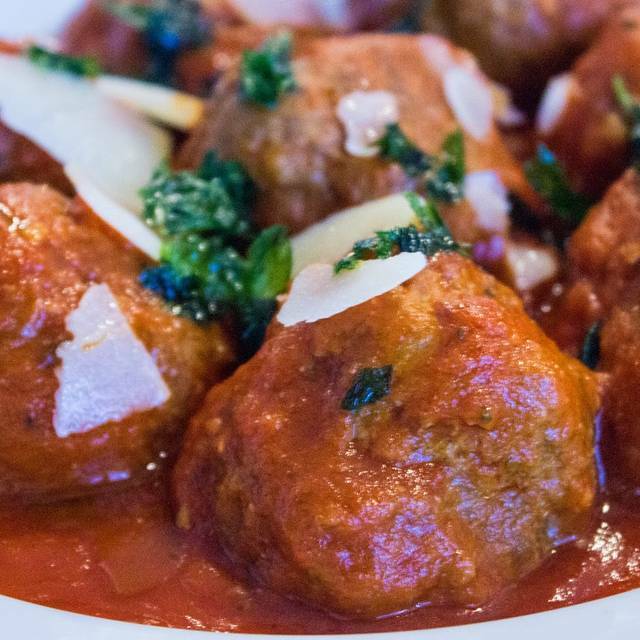 Our menu includes appetizers such as Calamari, arancini, Italian Sausage with rapini and many more options. We have 2 boards including a antipasto and a hot vegetarian platter. We have many pasta options with the Gnocchi and ravioli which are made in house. Also entrees including veal, arctic char and a wonderful tenderloin served with a red wine reduction with fresh grapes. Gluten free and vegetarian options! Fantastic new discovery. I was not disappointed bringing my family here for a milestone birthday. The owner was passionate about his place, excited to share the foods (which was delicious) and indulged me when I asked how his place came to be. 100% recommended this place to any and eveyone. Domenic was a great host, really enjoyed our time there. Food, service, ambiance was all fantastic! Looking forward to returning. A welcoming neighbourhood spot, with attentive service. 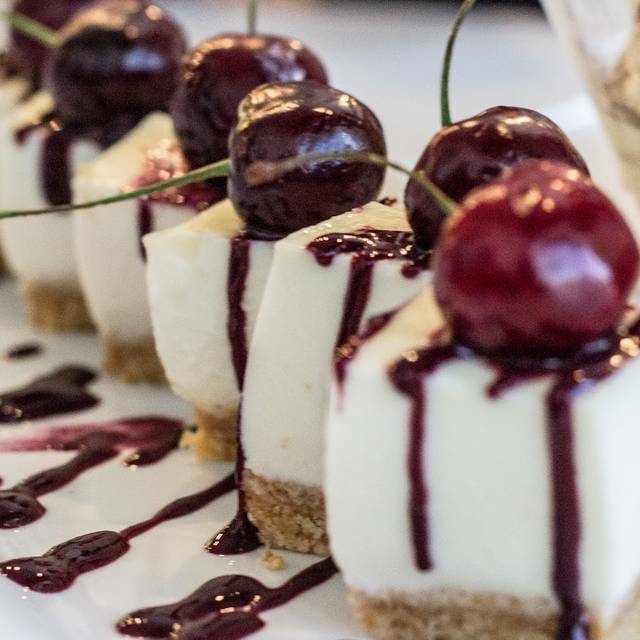 Very tasty homemade pastas and desserts, with good gluten free options. We look forward to returning. The food was great, the service was wonderful. Very friendly and attentive. The interior had almost a bit of a cafeteria feel to it, but the tasty Italian food and great service made up for that in every way. And the prices are very reasonable. We will be back and have recommended it to friends already. Really noisy but there were 2 Christmas parties and the staff were aware of the noise. I recommend covering ceiling with sound dampening material. Really enjoyed our meal! The wine was excellent and food was delicious. The owner and staff were very friendly and treated us very well! We will definitely come back! Always great at SS106 Aperitivo Bar! Food never disappoints as it is really authentic Italian food but in a very modern Italian setting. Such a social vibe. Staff is always friendly and never feel rushed or forced out. We had lunch at SS106 during the week, so overall the environment was very quiet. There were only 2 busy tables, of which 1 was ours. We chose the charcuterie platter which was definitely enough to share between 2 persons. The platter was well diversed and also included cheese. As we were afraid the platter would not be enough, we also added an appetizer to share (Arancini). The rice 3 balls were definitely enough for 2. On a very busy Friday night, Dom moved mountains to accommodate our reservation of 5 that ballooned to nine, even though there wasn't a seat to be had. The consistently amazing food and efforts of this establishment is why we drive 40 minutes across town to enjoy this terrific place. Very good service from the owner! He had great suggestions for food and drinks and held a great conversation with us! Food was great as always. Great place to get together never feel rushed. Good place to meet friend and have an enjoyable evening. This is a small neighborhood restaurant owned by a lovely brother and sister. The food was fresh and delicious and the service was very good. 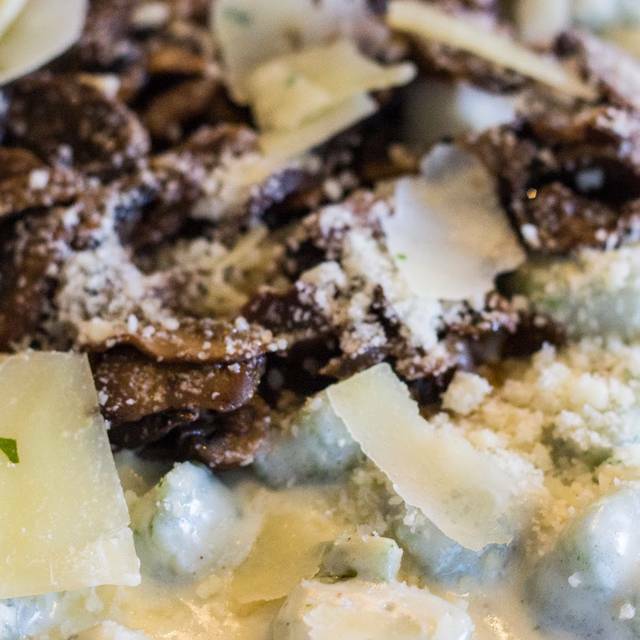 Mushroom gnocchi was plentiful with a rich cream and loads of mushrooms. The tiramisu was definately one if the best we have ever had. Fantastic service and amazing food. The coffee was delicious! Have to try the gnocchi, amazing! Great spot with nice atmosphere and friendly staff. We recently moved to the neighbourhood and I am so happy we found this place. The food, drinks and service were excellent, and the owner was outstanding. What a great place. We will be back. This is a wonderful neighborhood restaurant. Staff is always friendly and the food is delicious. Pasta is made in house and ravioli is to die for. We decided to drop in on a Saturday night not knowing what to excpect. 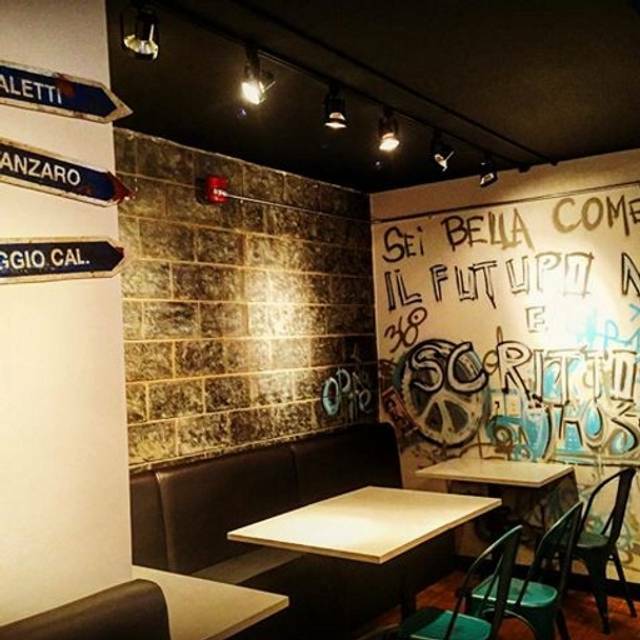 Its a real authentic Italian space, not pretentious with authentic food. SS Apretivo has a great vibe with amazing food. The owner is on site working and you can tell he loves what he does. 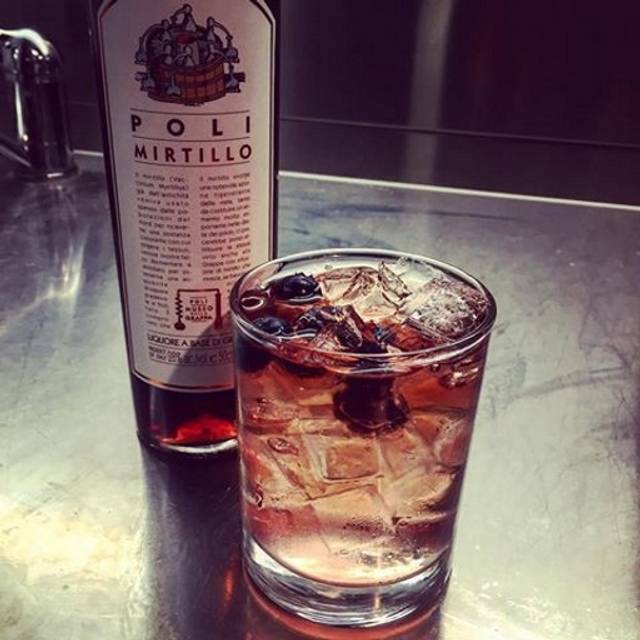 The cocktails are also creative and executed Italian style. Felt like a few of the places I visited in Roma. Ciao Bella! Very authentic Italian setting. Not fancy, but very interactive. If you want a quiet place, this isn’t your place. Great waiter, very Italian. Small place (hole in the wall) with excellent food - back to try their pastas. We had gnocchi and ravioli both of which were were as if made by “nana”. Decent wine list. Great value for really good food. Service was friendly and very good. We all enjoyed our food. The pasta tasted fresh. The portion for the Caprice salad was excellent. Great food reasonable priced. Staff are attentive and accommodating. Portion sizes generous and great for sharing. This was 4th visit and will return. After months and months and months of going past this restaurant and thinking it was an Italian pub with pub food, we ended up there one night with friends and now I have a new favourite restaurant in my 'hood!!!!! WOWZER!!!! I had a super yummy refreshing peach bellini to start. We ordered a vegetable platter to share and it was so delicious. The veg were grilled perfectly and there was a great assortment. And plenty for 4 people. I ordered the gnocchi after struggling over to make a decision on what to order. Our server told us the gnocchi had just been made that afternoon. Boom. Decision made and it was amazing!!!!!!!!!!!!! And huge portions. I actually took some home for lunch the next day. Our friend ordered the pizza, which also looked really good. We were too stuffed for dessert but I bet they would be amazing too. I will definitely be back. It's affordable, casual, amazing food and our service was incredible. The restaurant has the vibe that you are dining at your Italian best friend's house with all of their family!!!!!!! The food is outstanding and reasonably priced. Food was amazing , service was exceptional will definitely be back. Came for dinner, first time my boyfriend met my parents. Not only were the staff incredible and friendly, but the FOOD was INCREDIBLE!!!!! We all shared from each others meals, because it was too good to miss out. The liquor menu had everyone impressed, and we could not wait to return... ASAP. This place was just phenomenal. Went here for a Valentine's day dinner. They had a set menu. We are vegetarian and they customized our menu to fit our restrictions. The food was incredible. Amazing flavor. My wife and I were just amazed with this. Service (pretty sure it was the owner who served our table) was also incredible. The waiter spent a lot of time with us and we could see with other customers going over things and describing not only the food but a bit of history to it and where to find certain ingredients. It just added to the whole experience. Will definately return again. Fun spot, delish food! welcoming service and live sports, MUST try! SS106 never disappoints! Food is always on point and staff is great...usually I get pasta when I'm there but this time I tried the pizza and it was great as well! We had one cannoli and one cheesecake and both were very delicious! This place has quickly become one of our fav's. The pasta is made fresh and is to die for. 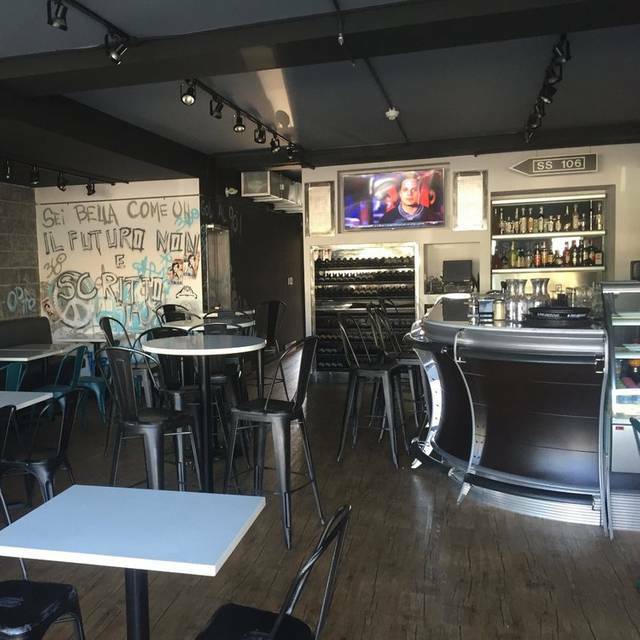 A very nice italian restaurant nicely located inner city. The food was delicious and the staff was nice. A great place for lunch. A genuine Italian feel and experience. Awesome food, authentic experience. This is a true Italian cafe/bar style in Italy. This isn’t a candlelight experience it’s a place with awesome food and relaxed environment. Dude who commented before me....Bruschetta is always cold unless it’s been sitting under heat lamps way to long. Great wines and wicked food for an exceptional value. I’ll be taking clients here this week to enjoy again. Noisy noisy noisy great place for people under 35 if you don’t mind the noise The stereo is really getting a work out. Attractive decor really nice Italian made bar really adds to the ambience, I really like the rollup door what a great way to bring your patio into the restaurant Calgary weather depending. The Bruschetta looked great but was quite cold destroying the taste from the tomatoes and the olive oil. When I asked about this I was told that’s the way they serve it in Italy which is news to me. The Calamari on the other hand with some of the best I’ve ever had lightly breaded and perfectly cooked a real treat. I could see it coming back for lunch if they kept the stereo volume under control I bet you the chef could do great things with seafood. The olives we’re good but nothing special. At this point I could not handle the noise and left. The rest of the people at the table stayed But didn’t say much about their meals. Very trendy yet very Italian. The food is not just good it's amazing! The best Italian food I've had in Calgary in a very long time. My friend and I shared the Arancini, then I had the spaghetti pescatore while he had the house made gnocchi in tomato sauce. All the dishes were so delicious. Do Not leave this place without having a espresso or Cappucino! The coffee made me feel like I was back in Italy! Will be back! loved the place! -Very European like with Italian music playing in the background. The food was outstanding and very generous portions with great prices! The service was also amazing, friendly staff and very welcoming! I would definitely recommend this spot and i will definitely return! Outstanding service and scrumptious food. The staff were wonderful in accommodating our Girls Night Out. Highly recommended for a fun time and fine food. A real gem!